"A delicious hot appetizer or main dish, with a buttery garlic and lemon pepper flavor. 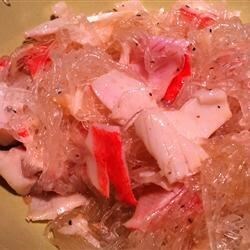 Very easy, uses inexpensive imitation crabmeat. May serve as is or with a dipping sauce of your choice. Also good on rice or pasta. Great when on toasted Italian bread, or on pizza, especially with a cream sauce"
In a medium sauce pan, heat butter until melted. Add the garlic and saute lightly. Add the imitation crabmeat and cook over medium heat, turning gently. Add the lemon pepper and continue to cook until hot. Add grated cheese and serve. This is a quick easy low carb fixin.. I got creative and stuffed the mixture into some mushrooms.. and topped it off with fresh parmesian.. it is soooo yummy! This was NOT a keeper...we made toasted crab sandwiches topped with provolone cheese and it was bland to say the least. Definately will NOT make this again. This was very good. We had it over noodles.Nice change from the usual pace. Thank-you!!! Itiban oisidesunee! Excellent! I served it over toasted french bread and relished every bite. Simple and perfect. I'm not sure if I disliked this recipe so much because I expected it to make a sauce or what but this turned out terrible. I served it over pasta and it just didn't work for me. Very very very different! I only use imitation crab for ceviche. I have never had anything like this. Will make this again, but add more seasoning.